Today I met Penny, Jane, Pat and Mike for my first full day's birding since arriving back in Spain on the 2nd. 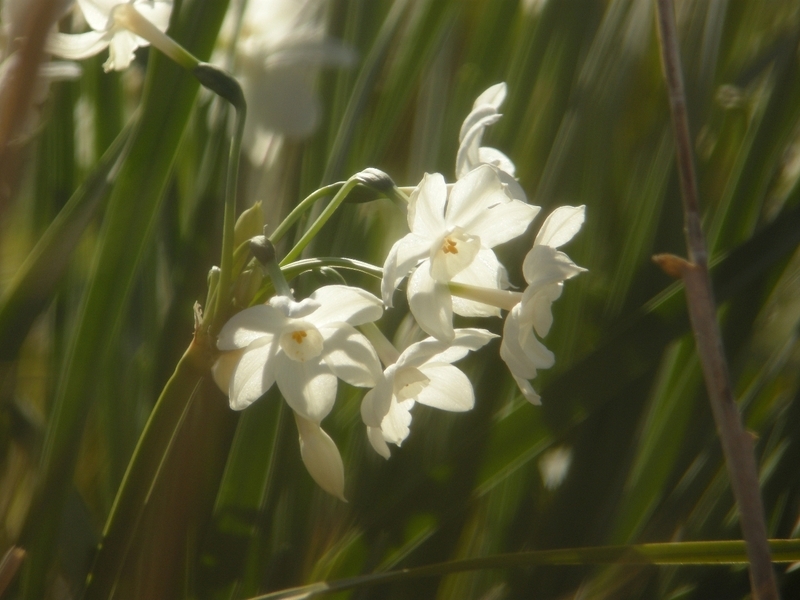 It was a bright sunny day with a chilly breeze which subsided around the middle of day when it became quite warm. It was still dark at 7:50 when I arrived at Penny's finca near Casares and the first bird on the day list was an EAGLE OWL we could hear one calling from the cliff face below Casares village. By the time we all assembled and set off it was light, we listed Black Redstart, Serin and House Sparrow along the track to the main road. Penny did all the driving it ws nice to relax in the back of the car and spot a few birds along the way. At La Janda we had bright sunshine with a cool breeze. We quickly listed Corn Bunting, Stonechat, White Stork, Crested Lark, Cattle Egret and Goldfinch. 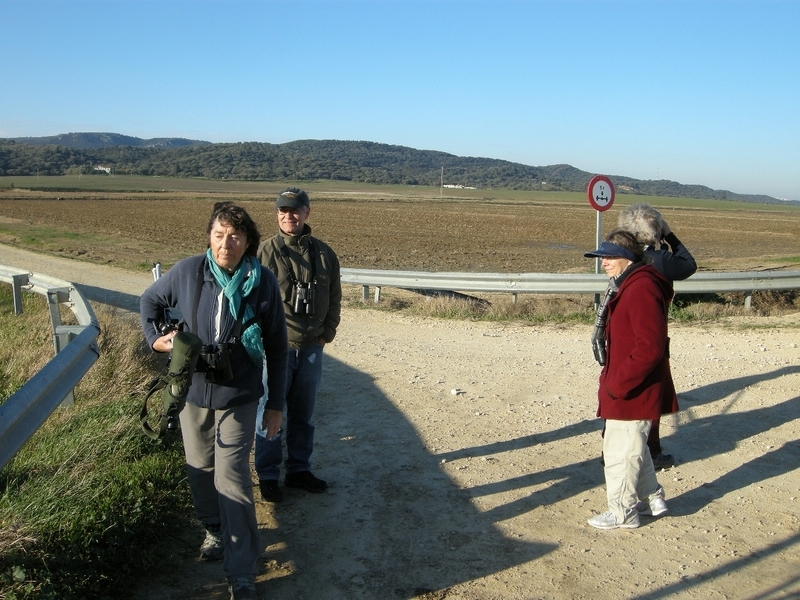 We stopped on the central track where a large group of Spanish birders weee looking at a Short-eared Owl, very nice. We saw our first Hen Harrier and two of our target birds, COMMON CRANE, they were distant but their evocative call is unmistakable, four Greenshank flew below them. Other species a little closer were Northern Lapwing, Skylark, a single Calandra Lark, Meadow Pipit, White Wagtail, Common Sandpiper and Grey Heron. We moved along the central track making a few stops to scan the rice fields which were just stubble and partially flooded, we saw Marsh Harrier, lots of White Storks, a group of 20+ Golden Plover, a few Common Snipe, Glossy Ibis, Zitting Cisticola and to our great delight we found 4 Black Storks. 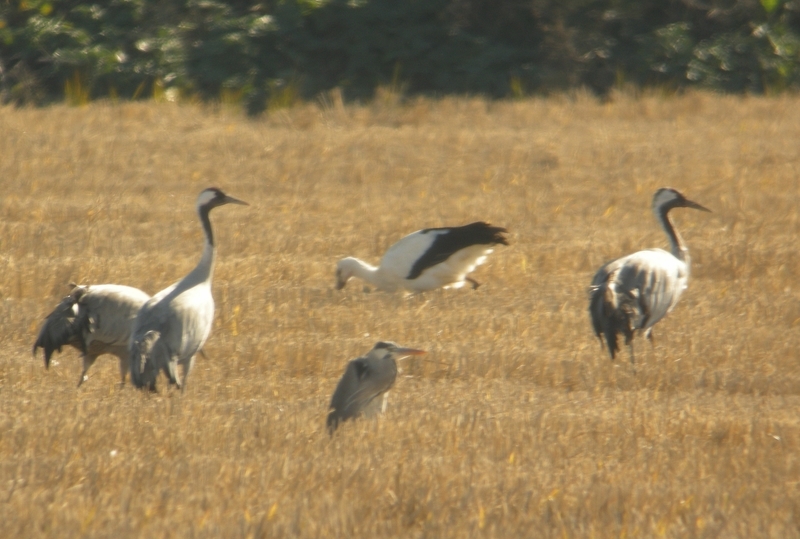 A flock of 23 Cranes flew over us, we were all a little disappointed at not seeing large numbers of this species. We then drove over passed the 'smelly' farm stopping to watch Common Pheasant, Red-legged Partridge and Eurasian Jackdaw. We bumped into the Spanish birders who got us onto both Bonelli's and Spanish Imperial Eagle, very high up but in good light. A pool on the Benalup road produced sightings of Litle Grebe, Common Kingfisher, Common Buzzard and Common Sandpiper, we had great views of a male Hen Harrier as it sat on a mound in a field, too distant to photograph rhough. Our return journey across La Janda gave us much better views of both of the eagles seen earlier and much better views of Common Crane, Glossy Ibis and White Stork, we even found a Great White Egret in with them. 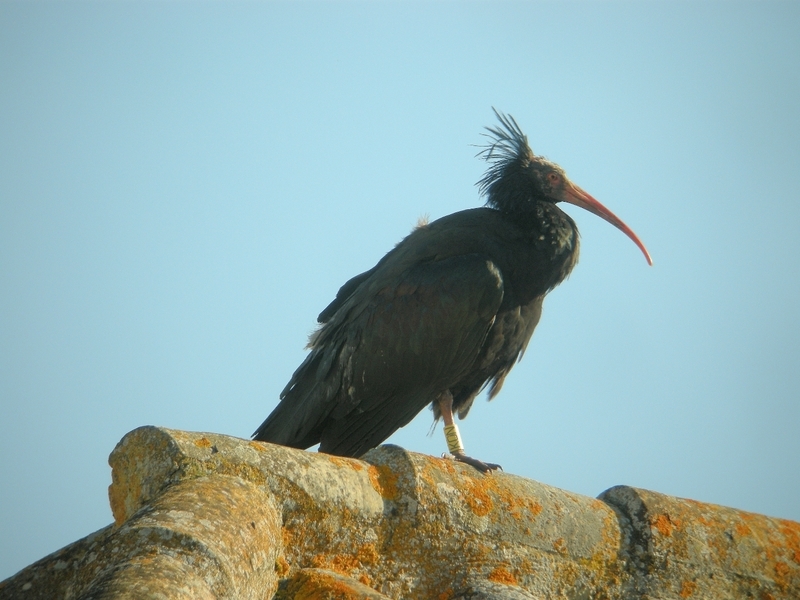 At Montemedio Golf Course we searched for the flock of Blad Ibis but only found one on the hacienda roof, but we did add Common Chaffinch, lots of Common Chiffchaff and even more White Wagtails. 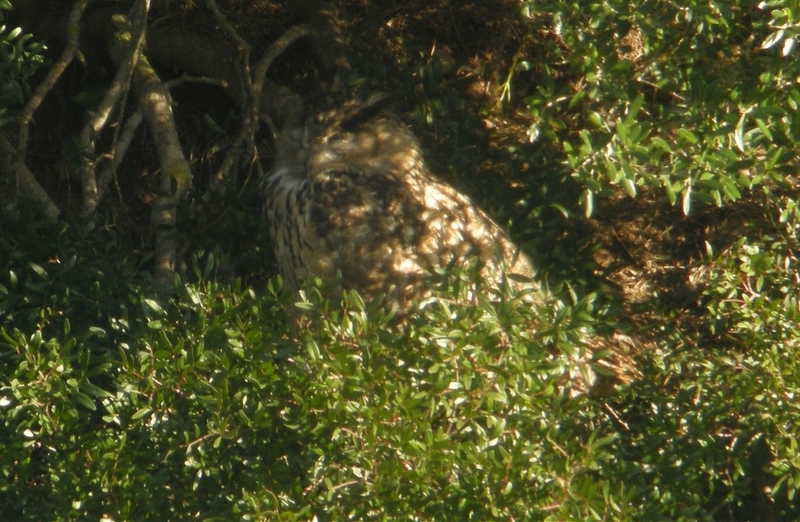 We made a quick stop at a nearby quarry to look for an EAGLE OWL at a regular roosting site and after a few minutes of searching we found one, fantastic now we had one on the list. Our last port of call was the large, relatively new reserve at Barbate, we noted two Caspian Terns fishing over the river Barbate as we crossed the bridge. The marshes we covered in birds, thousands of waders fed on the mud. This high-tide roost and feeding area is superb, as was the afternoon light. We listed many species there, a flock of Audouin's Gulls was nice to see. Great Flamingo, Grey Heron, Eurasian Spoonbill, Common Shelduck, Mallard, Black-winged Stilt, Pied Avocet, Greenshank, Grey Plover, Curlew Sandpiper, Ringed Plover, Kentish Plover, Sanderling, Dunlin, Little Stint. A few L B B and Yellow-legged Gulls were dotted about as were B H Gulls. On the way out of the reserves we saw two more Bald Ibis feeding in a paddock. Back at Penny's at 6:45 pm we heard the EAGLE OWL calling again, a fitting end to a great day out.